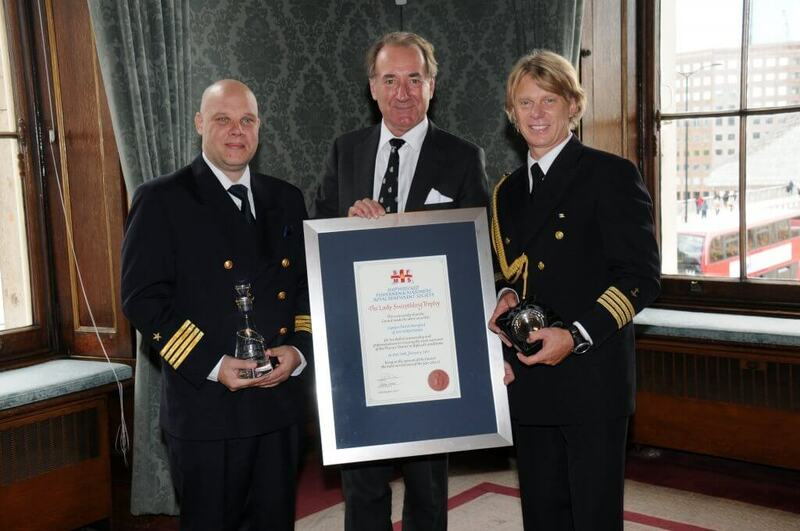 Captain Patrik Norrgård was presented with the Lady Swaythling Trophy for ‘Outstanding Seamanship’ at the Charity’s annual Skill & Gallantry Awards for the rescue of a seven man crew from a sinking ship in the Dover Traffic Separation Scheme on 13 January. His Chief Officer, Captain Marek Rowiński, was also recognised for his part in the rescue. On the evening of 13th January, the MV Norstream responded to a Mayday call relayed by HMCG from the MV Fluvius Tamar, who had reported at 2348 that she was sinking 35 nm NE of North Foreland in the Dover Strait Traffic Separation Scheme. The Norstream, a 20,000 ton 180 metre long Finnish owned and flagged Ro-Ro cargo vessel under charter to P&O Ferries, operating on the Zeebrugge to Tilbury route was on her way to Tilbury. Under the command of Captain Patrik Norrgård with Marek Rowiński as the Chief Officer she was the closest vessel to the reported incident and responded immediately reaching the scene 15 minutes later. There was a north-westerly gale blowing, force 8-9, with waves of 4-6 metres. Sea temperature was about 6 degrees C. Visibility was good. The casualty, Fluvius Tamar, a 90 metre long 3,000 ton general cargo vessel with a crew of seven, was on passage to Spain. The crew had noticed that the bow was dipping and was starting to go down. They prepared the lifeboats and sounded the alarm. The vessel began to sink and by the time the crew had reached the poop deck, the life rafts were already afloat and the crew were then in the water. Taking into account the weather, the Captain of the Norstream decided to stop at a range of 2-3 cables to the NE of the sinking ship. She arrived just two minutes before the casualty’s bow submerged. In the meantime the lookouts spotted 6 flashing lights apparently from lifejackets seconds before Fluvius Tamar disappeared. This was at 0030. After a couple of minutes the lookouts reported two liferafts and one open lifeboat. A paramount consideration for Norstream’s Captain was to keep a safe distance from the sinking ship. It was unknown how fast Fluvius Tamar would reach the sea bottom. The depth was 40 metres and Captain Norrgård estimated that it could take a couple of minutes. Fluvius Tamar had an ‘air draft’ of 22.5 metres so there was a risk to his ship. Additionally, he was concerned that loose parts of the sunken vessel and her mooring ropes could get into the ferry’s propellers. He manoeuvered the Norstream so as to give a lee for the survivors on the port bow. The port side pilot door, 3.5 metres above the waterline and 44 metres for’ard of the propellers, was opened and the pilot ladder lowered. To avoid sucking survivors into the propellers the ferry approached in such a way that all survivors were located ahead of the pilot door with the wind 45 degrees on the starboard bow, giving a heading of approximately 315 degrees. Using her bowthrusters and working the port engine astern and the starboard ahead to maintain position the wash from the port propeller kept the survivors ahead of the danger zone aft. Crucial to this manoeuvring was Chief Officer Marek Rowiński who took charge at the pilot door reporting distances to the survivors by radio to the bridge and then risking his own life by hanging out from the door to grab them and help them get to the pilot ladder. With a drift of 2 knots Captain Norrgård was concerned that the rolling ferry and the strong drift could crush survivors once they were alongside. The ferry’s drift was in fact creating a kind of water cushion 1-1.5 metres between the ferry’s hull and the survivors. Precise ship handling and effective communication allowed the ferry to approach the first survivor safely. The crew struggled to lift him as he was weak, possibly suffering from moderate hypothermia. He was unable to climb the pilot ladder. His immersion suit was waterlogged. At the third attempt, synchronizing the lift with the crest of the swell, four crew men manged to drag him onboard at 0045. Recovery of the second and stronger survivor was easier but it still required three men. The next task was the recovery of the liferaft with the remaining five crewmen inside it. The liferaft was about 80-100 metres forward of the second survivor and in a dangerous position under the port bridge wing. It could have been hit by the flared bow as the Norstream pitched and rolled. Fortunately the second survivor was picked up quickly allowing the master to move his vessel ahead. The liferaft was secured by heaving lines but was hitting the ferry’s hull badly. The five survivors were brought onboard safely and quickly by the pilot ladder. The recovery was completed by 0100. The first helicopter arrived on Scene at 0046 an hour after the Mayday. The survivors were taken ashore in two helicopters. Professionalism, good judgement, outstanding seamanship and crew teamwork ensured the safe and timely recovery of the entire crew of the Fluvius Tamar.